John Travolta came to fame playing Vinnie Barbarino on the popular 1970s sit-com Welcome Back Kotter. He also had a small but crucial part in Carrie, and played the title role in the TV tearjerker The Boy in the Plastic Bubble. On the set of Plastic Bubble, he had a famous affair with Diana Hyland, the actress who played his mother. Hyland died of cancer the following year, while she was playing the mom on early episodes of Eight is Enough. Travolta parlayed his TV fame into movie stardom, dancing in Saturday Night Fever, singing in Grease, and two-stepping in Urban Cowboy. Travolta's career sank with spectacular duds like Moment by Moment with Lily Tomlin, Two of a Kind with Olivia Newton-John, and Staying Alive, the Sylvester Stallone-directed sequel to Saturday Night Fever. After that, Travolta made three semi-popular Look Who's Talking movies with Kirstie Alley, but otherwise dropped off the Hollywood map. In 1994, Quentin Tarantino sought him out for Pulp Fiction. Travolta played the oddly innocent hit-man Vincent Vega, and danced with Uma Thurman. After that, he was an A-list star again. His subsequent films include Get Shorty, Swordfish, and Face/Off, with Travolta as Nicolas Cage and Cage as Travolta. A long-time Scientologist, Travolta produced and starred in a 2000 film adaptation of L. Ron Hubbard's science fiction novel Battlefield Earth, one of cinema's all-time turkeys. In The New York Times, Elvis Mitchell said it "may well turn out to be the worst movie of this century". Roger Ebert said it was "not merely bad; it's unpleasant in a hostile way". Travolta says he once used Scientology's "Assist" method, a system of healing through "getting in communication" with the body, to speed Sting's recovery from "a sore throat and flu symptoms or something." 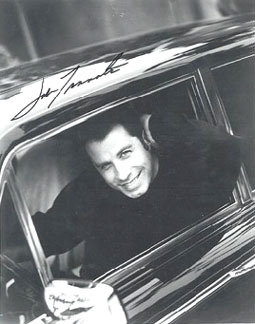 While vacationing in the Bahamas with his wife, children, and staff, Travolta's 16-year-old son Jett was discovered dead in a hotel bathroom by the family's nanny, Jeff Kathrein, on 2 January 2009. Jett Travolta was widely reported to have suffered from autism, but Scientology maintains that autism does not exist, and the Travoltas always explained that Jett instead had Kawasaki disease, an immunological illness they said was caused by exposure to carpet-cleaning chemicals. Rumors have circulated for years, but took on new strength when paparazzi photos of Travolta kissing Jeff Kathrein on the lips were uncovered by TMZ in 2006, now widely distributed. While nobody denies Travolta is happily married, the photograph is difficult to explain in light of the fact that American-born men do not generally greet other men in that manner. See also Owen Thomas, "Travolta's Rumored Gay Lover Discovered Dead Son", Gawker, 3 January 2009.